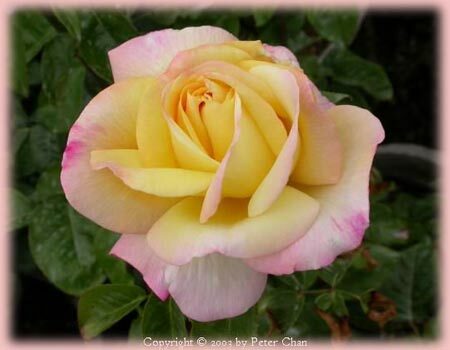 The world’s most famous rose, in brilliant yellow and pink, first introduced to the U.S. by The Conard-Pyle Co. over fifty years ago. More popular today than when it was first introduced. A rose your garden should not be without. Yellow blend, pink edges. Mild to strong fragrance. 40 to 43 petals. Average diameter 6″. Very large, full (26-40 petals), cupped, high-centered bloom form. Blooms in flushes throughout the season. Height of 4′ to 6′ (120 to 200 cm). Width of up to 3′ (up to 90 cm).